Magpies is Bringing a Little More Fun to the Christmas Countdown! For anyone who needed reminding (and we’ll be honest here — no one did) the holidays are just around the corner! And while grownups might have their internal calendars on lock, that Christmas countdown isn’t so easy for little ones. You’re in luck! At Magpies, we’ve got a fun-tastic way for families to infuse something special into their celebrations. The Christmas Star from Afar, Christianity’s answer to Elf on the Shelf, incorporates that exciting “hide and seek” element into the nativity story. The concept is simple. 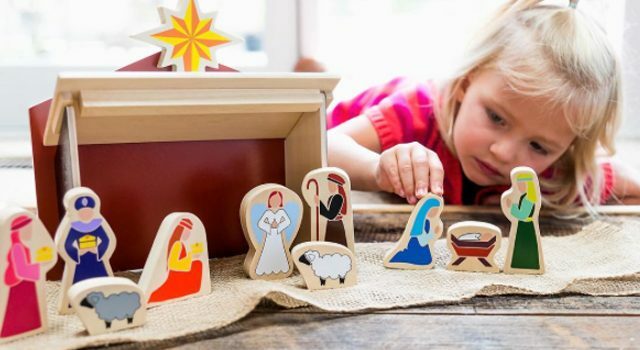 Find a special place to set up the wooden nativity contained within the set and, each night leading up to Christmas, hide the star around the house. Allow your children to search out the star each day and, once it’s found, move all three wise men to its location. There’s even optional scripture the family can read through each night. On Christmas Eve, bring the star to rest on top of the stable. The next morning, when the wise men finally reach the nativity, everyone gets to celebrate Jesus’ birth! We love anything that gets families up, moving and enjoying one another’s company. And the fact that this gift doesn’t merely add to the fun, but helps get to the true meaning of the holiday, is even better. Stop in today and pick up your set! Then, get creative! If you’re in need of a few creative ideas (not just for Christmas Star from Afar, but that wiley elf, too) our Pinterest board might help. We hope these finds make your holidays even happier!